Jenkins is not alone. 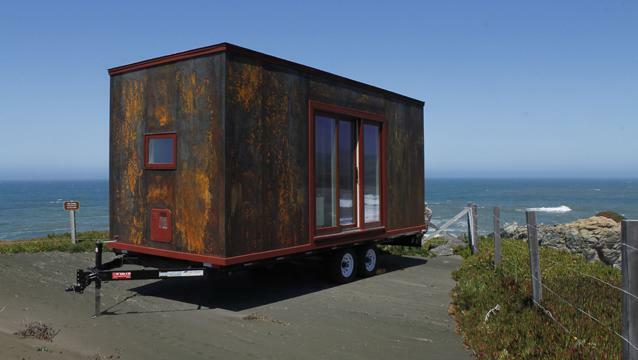 She represents a growing number of people that are opting for “tiny house living,” according to Tumbleweed Tiny House Company. Tumbleweed is a Sonoma, California, company that teaches workshops all over the country on how to build tiny homes – which have grown in popularity in recent years. They also offer tiny house floor plans and are building for people that want their “houses-to-go” readymade and delivered. In the above video, chief marketing officer Debby Richman tells The Daily Ticker where the growth in this trend is coming from and how tiny living actually works compared to a "normal" home. Richman says when the company was started in 1999, people were learning to build tiny homes because they wanted to get off the grid for ecological concerns. Fast-forward to the financial crisis -- in the years since Richman says people are also buying them for economic reasons. For example, to shed a big mortgage and move into a smaller home, or to house a family member instead of remodeling. But where do people park their little house on wheels? Richman says they either buy land or rent it, or she sees people put them in their backyards for a young college graduate or elderly parents. She says even the concept of “tiny home communities” is taking shape. The trend in tiny homes is becoming more luxurious, too, with people wanting 117 – 172 square feet versus the really tiny ones that are less than 100 square feet. Richman insists that one to two people can live comfortably in that space. And that trend is being helped by what you could call a “tiny mortgage.” Richman explains that because their houses are built to RV code and the manufacturers are RV-approved, banks are willing to loan. So instead of $60,000 upfront for a "luxurious" tiny home, you put 10% down and pay $400 a month for a 15-year loan. Meanwhile, another homebuilder that’s gotten into the slightly larger “tiny home” space says he’s seen a lot of interest in the homes for similar reasons that Richman lists. Dan Goodin of Nationwide Homes started Eco Cottages and says it's difficult to finance a 600-square-foot home (not on wheels), which has slowed the progress of this market for people who want to go this route. They're too difficult for lenders to appraise, Goodin says. He's seen a growing trend in ‘care cottages’ or ‘granny flats.’ These tiny homes are an alternative to nursing homes, and go right in the backyard of caregivers’ homes. Stephen Melman, director of economic services at the National Association of Homebuilders, puts the demand in perspective.